Video: The Baldrige Criteria creates a plan and a process towards performance excellence. Baldrige (May 18, 2012) The Challenge of Being Excellent: Completing the Puzzle. Retrieved from Baldrige YouTube Channel. The Partnership for Excellence is the Baldrige-based program for the states of Ohio, Indiana, and West Virginia. We support organizations on their journey towards performance excellence. We assist organizations by evaluating approaches (processes) - and how they are evaluated, improved, deployed, aligned and integrated throughout the organization - by assessing their effectiveness at driving organizational results. Our primary product is a comprehensive organizational assessment that helps leaders better understand and prioritize key strengths and opportunities for improvement. Advising is for organizations that are new to the Baldrige program and just getting started. A professional coach will work with your team to further explain the Baldrige Excellence Framework and help you draft a 5-page Organizational Profile. Once completed, TPE Examiners will provide written feedback to you. Successful completion of the Advising level results in the “Spirit” award recognition at TPE’s annual Quest for Success Conference. This is Part II of the Advising & Partnering program. Your professional coach will review the feedback report for your Organizational Profile and assist you in interpreting the feedback including linking your organizational profile to the process categories and aligning to the Baldrige Criteria, and developing a timeline to get you started on developing a 25-page abbreviated application addressing the Baldrige Excellence Builder criteria. The Partnering phase focuses on processes, systems and associated results. Once the 25-page application is completed (there is no time limit) examiners will provide a written feedback report. Successful completion of the Partnering level results in the “Pioneer” award recognition at TPE’s Quest for Success Conference. Some organizations which have already developed an organizational profile choose to begin their journey with TPE at this level. Complete the Advising & Partnering application. This level is focused on providing a complete feedback report to all applicants and recognizing their performance relative to the Baldrige Criteria. It is not competitive among applicants; your only competition is you, on the journey to performance excellence. The Examining Program is the traditional full 50-page application and assessment mirroring the national Baldrige Performance Excellence Program. Organizations already familiar with Baldrige may enter directly into our examining program. An Intent-to-Apply form is due to TPE on August 15th each year and a full 50-page application is due on December 1st. The examining process leverages the human resources and analysis provided by our trained examiner team. TPE Examiners evaluate the application independently and then as a team to reach consensus. A three-day site visit is completed in March to verify and clarify the information in the application. The applicant receives a written feedback report with strengths and opportunities for improvement. Judges make award level recommendations to the TPE Board of Trustees in May and applicants are recognized with a Bronze, Silver, Gold or Platinum (Governor’s Award for Excellence) Award at TPE’s Quest for Success Conference in September. Complete the Intent to Apply document. Here are some documents that can assist you in the application process. Questions? We offer a complementary executive presentation for those interested in getting started on their Baldrige Journey. The presentation is approximately 60 minutes and explains the Baldrige Excellence Framework, The Partnership for Excellence and our programs, and first steps to getting started. It is an ideal presentation for your senior leadership team and can be accomplished on-site or by webinar. After the presentation we can discuss how to best proceed. Contact us to be your guide on your journey to performance excellence! 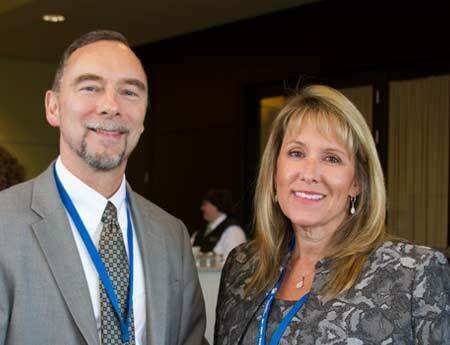 Photo: 2015 Quest for Success Conference attendees and presenters - Bob Fangmeyer, Balridge Performance Excellence Program Director and Tammy Dye, Schneck Medical Center CQO, take a time out for a photo.